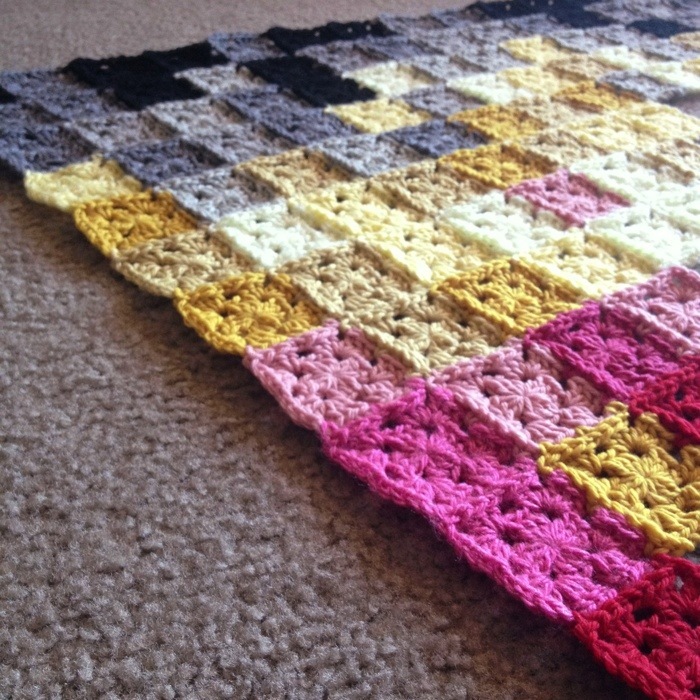 Over 400 squares in your most favorite colors, blended in this mesmerizing piece – 35-40 shades or more! My palette! I added a couple DK shades that I had in my stash just to fill in some gaps in the shading. 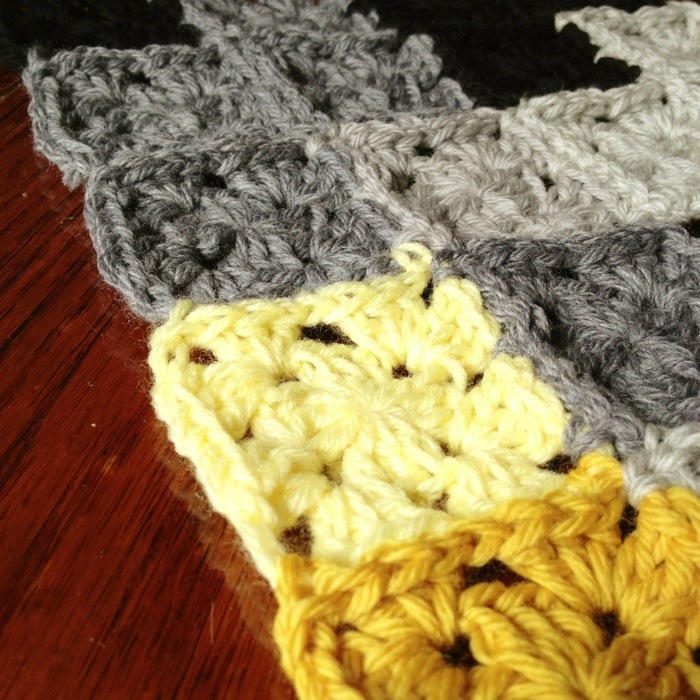 Above is the first little snippet that I made of this blanket. It took a little while to get used to all those tiny squares! 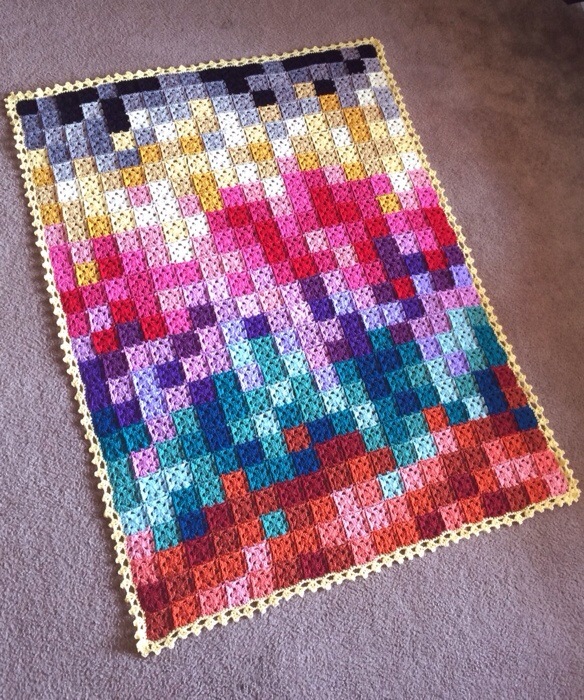 My job was to blend six colors – Grey, Yellow, Pink, Purple, Aqua, Orange – horizontally in a pixel blanket. 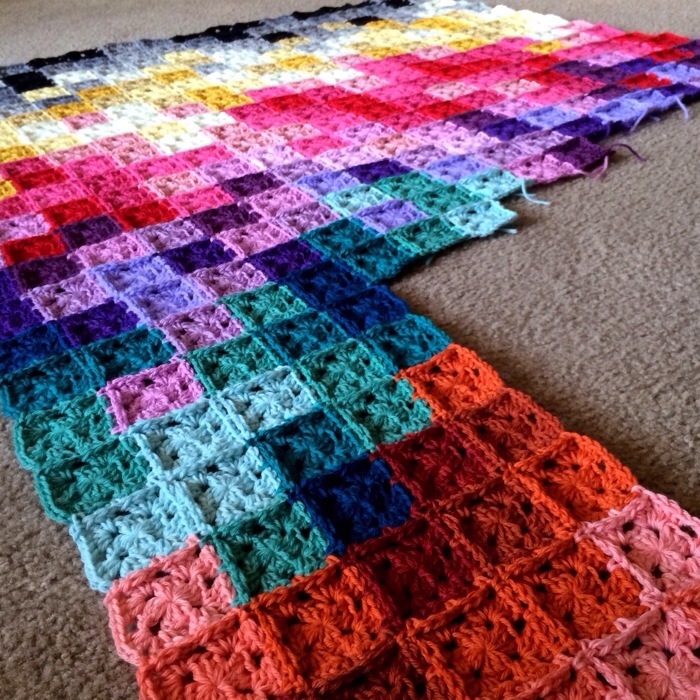 Normally, I blend in a more organic manner, as in my Geometric Lace pieces… On those natural pieces, I start in a corner and follow my instinct, but with this blanket, I felt like I needed more of a plan since I had to make somewhat of a stripe formation. 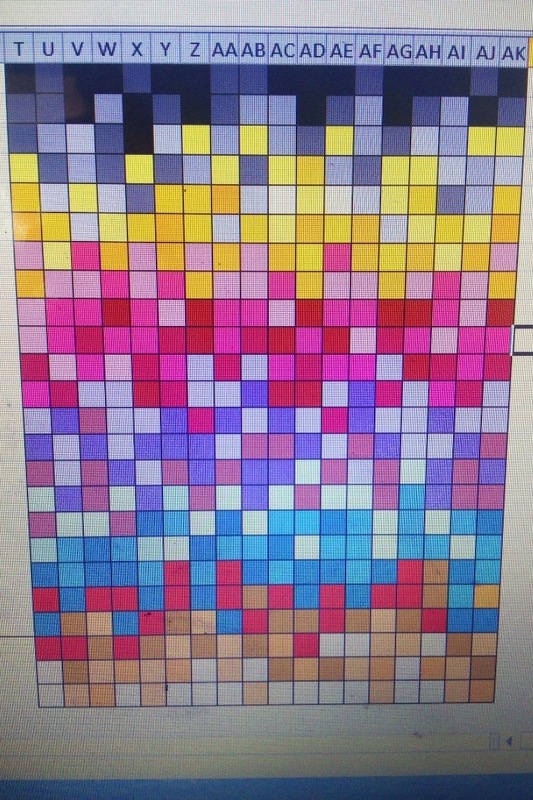 Below, you can see what I made using Excel… Ugh. I absolutely did not end up following this pattern. I used it for the beginning to get myself in the rhythm of the lights and darks, then I just let loose! There are 24 rows from top to bottom and 6 colors, so I estimated 4 rows per color and faded accordingly. My usual inner guideline is to put lights next to lights and darks next to darks… I step back from the piece and make sure I’m on track to keep uniformity, but then sometimes I’ll fold it up and just work in one area so that it doesn’t get too repetitive. Progress! Had to drop down and get the whole color range in there. So inspiring! 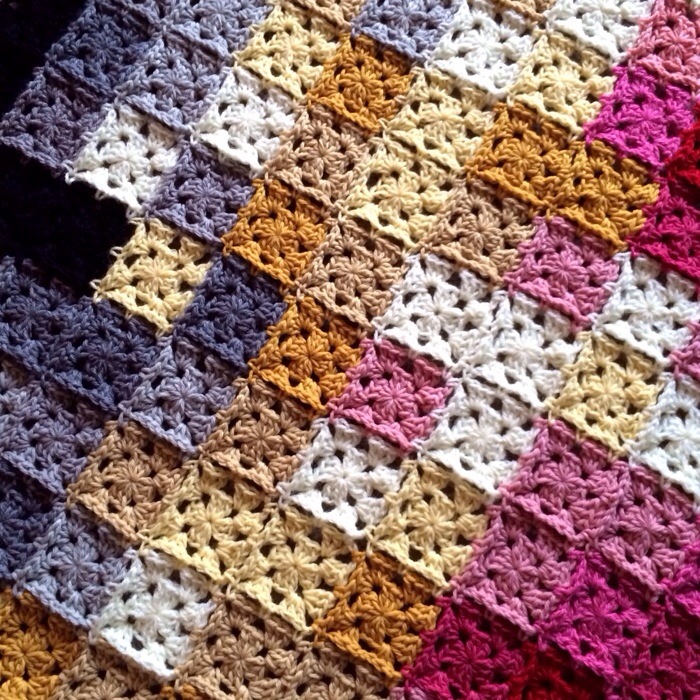 Posted in PixelatedTagged Crochet, granny join, Granny square, ScrapsBookmark the permalink. that is amazing! You must have been so chuffed to get it finished! Hi, Dara! I do have a post about color in the works 🙂 Hard to find time, but it’s on my list! Great love just looking at this pattern. I do want to try it but never could find any directions none how many, pattern, setting together. 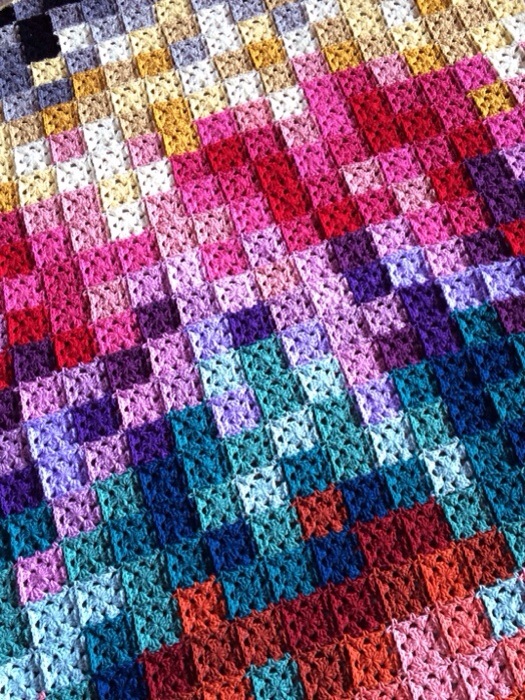 quite beautiful — an exciting new and innovative path for crochet! I love this! I can never finish one project because I always have to move on to your next! Awww… this is so absolutely adorable!! Makes me want to get my hooks out right now..
Do you have any advice for borderless joining after you’ve got all your squares ? Hey there! Do you mean like crocheting them together? I have done a slip stitch join where you join all squares across horizontally, then join all squares vertically. It looks nice! From there you can look at the loads of YouTube vids with “flat slip stitch join” – some go through flo, some blo, some both loops.. I like both loops bc it’s more sturdy, but it makes a ridge on top… If you like it, then it’ll work! At least the ridge isn’t as tall as when you SC squares together vs this slip stitch..
Hope this helps! Happy crafting! Beautiful work, made with gold hands. Congratulations from Italy! 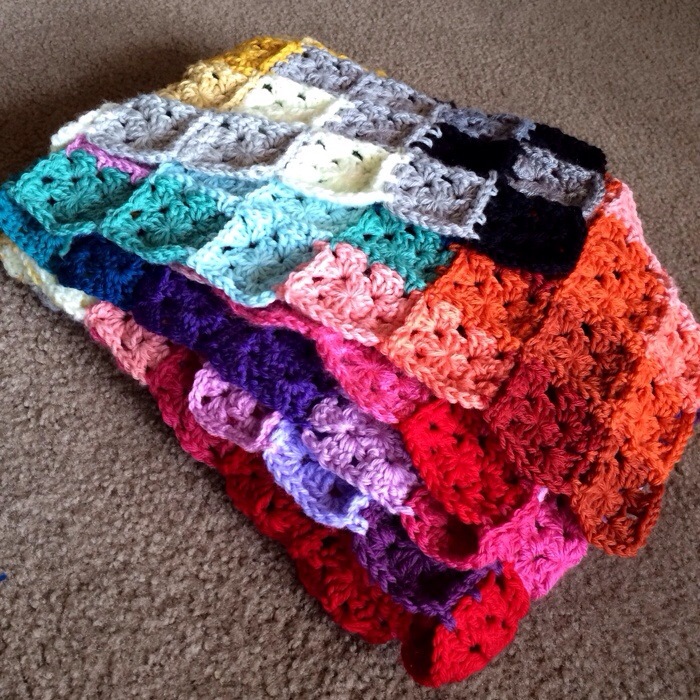 I simply love this blanket! I’ve wanted to do something like this. Where can I find your tutorial, that will show me more or less how to do it? I really really really LOVE this job 😍😍😍😍😍😍😍 wow when I saw my face was frozen up this is a incredible and blanket I haven’t never seen it !! I know this sounds crazy, but can you direct me to the pattern for the square itself? 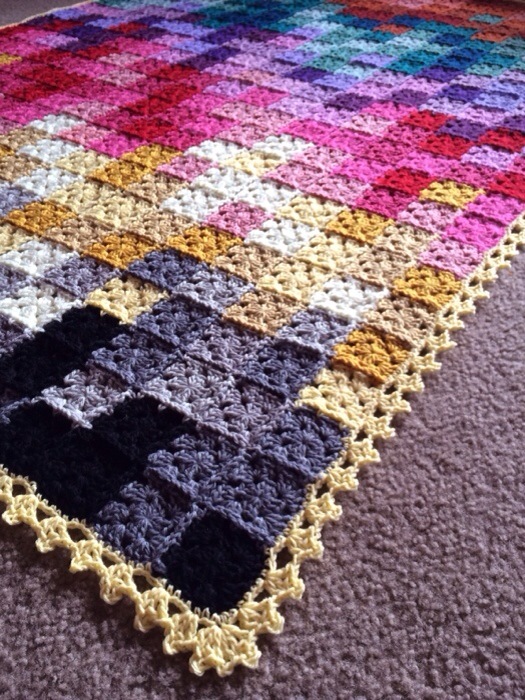 I’ve never done a blanket like this and I don’t know or have the pattern.’ Thanks! What does the underneath “wrong side” look like? Does it look different from the top of the blanket? Hi, did you ever make that post on color ok having yet?